Our set of 4 32 ounce (quart) condiment squeeze dispenser bottles are BPA FREE and made of High Density Polyethylene (HDPE) recycle code 2 plastic The opaque color (semi-transparent) allows you to see the contents of the bottle. The screw on cap comes with a foil liner inside the cap that can be easily removed if you have no need for it. You can use the seal for longer storage , transportation or gift giving your special homemade sauces. HDPE plastic is known for its durability and strength. While not as clear as other plastics these bottles are translucent and you are able to see your product inside the bottle. 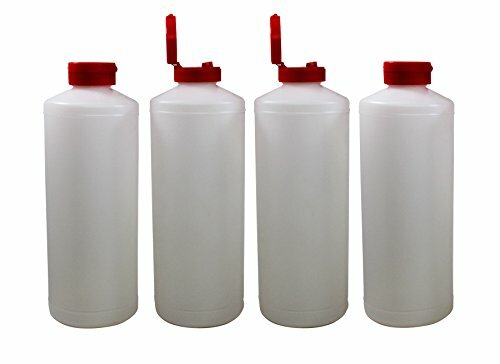 These HDPE bottles are able to withstand colder and freezing temperatures very well (-100° F) and higher temperatures moderately well (near 190° F). View More In Food Dispensers. If you have any questions about this product by Pinnacle Mercantile, contact us by completing and submitting the form below. If you are looking for a specif part number, please include it with your message.